A vertical view of the Taurus-Littrow landing area photographed on an earlier Apollo mission from lunar orbit. The mission photograph is surrounded on all sides by a computer-generated 360-degree panorama of the region as seen by an observer at the nominal Apollo 17 Lunar Module Landing site. The 360-degree panorama is divided into four sections, north-east-south-west. Each section includes an overlap of about 15 degrees with each adjacent section. The observer's eye level is 1.8 meters above the surface. The features on the panorama were marked by an overlay on the photograph. 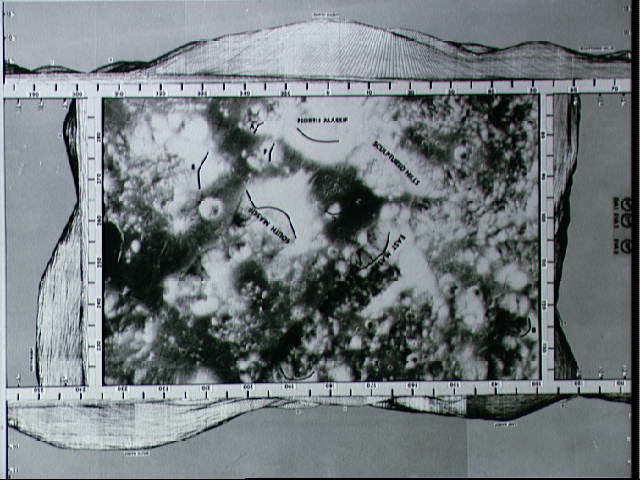 The panoramic scene was generated by processing a digitized form of the U.S. Army TOPCOM compilation of the terrain contours in the Taurus-Littrow landing area.